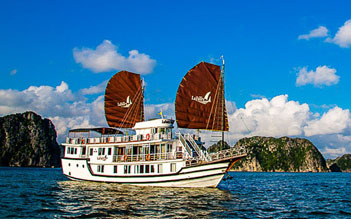 LaFairy Sails is a newly-built and traditionally-styled vessel in Halong Bay whose name is inspired by a magical cave with a hidden lake where they say fairies come to bathe. The ship features 11 cabins with the capacity up to 23 guests. The cabin amenities include hardwood floors and furniture, air-conditioning, en-suite bathroom, hairdryer, life jackets, sea-view windows, etc. Traveling with La Fairy sails, guests have the chance to participate in onboard activities such as swimming, kayaking, boat rowing, Tai Chi, cooking demonstration, squid fishing or excursions to caves and fishing villages.